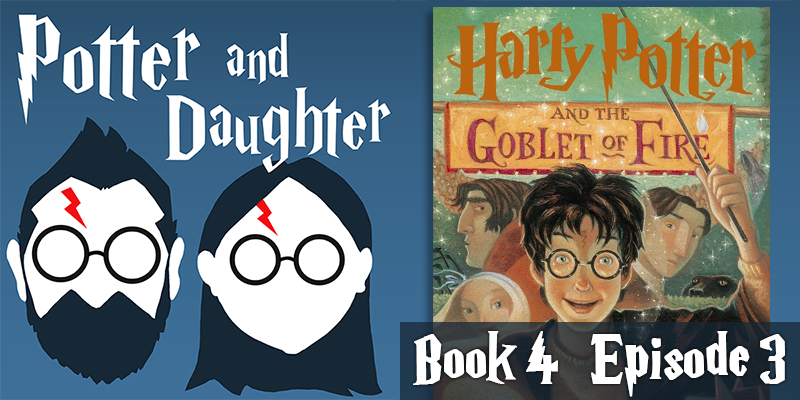 In episode fourteen of Potter And Daughter Joel and Lily discuss the events of chapters 19-26 of Harry Potter And The Goblet Of Fire. Harry is a Tri-Wizard Champion whether he likes it or not, and that means being tasked with… tasks! He faces the first two which see him in a sky high dragon battle and a deep sea mermaid mission. Harry, Ron and Hermione also get their first lessons in teenage courtship rituals and not all of them pass with flying colors. Can’t believe I left it so long to pick up on, but ‘Wyrd Sisters’ is another term for Witch, so I guess that’s what the band at the Yule Ball were going for with Weird Sisters.